Everyone loves going to Ikea no matter whether is it for the yummy food there, the gorgeous furniture or even their beautiful displays that have you wishing you could duplicate everything in your home. While not all of us have the budget for a complete overhaul of Ikea, this doesn’t mean we can turn our Ikea furniture into something truly outstanding. Get ready to change your home with these hacks. These sturdy yet stylish panels are super versatile and can be used for almost anything. They are lightweight and come in different sizes to suit your needs but we think this cool idea of adding some inexpensive legs to transform it into a unique coffee table is awesome. There are so many possibilities for this comfy and functional daybed as it can be turned into sectional sofas, small twin beds or just used on its own. In this living room, adding some long bolsters make it a really cosy sectional sofa where you can lounge about all day. The YPPERLIG series comes in many styles and shapes that are great for additional storage options but you can mek it look even better with minimal effort. Paint it a gorgeous colour to match the theme of your home and you get a stunning and improved shelf. Don’t go thinking that this table is lacking in something because it definitely isn’t! 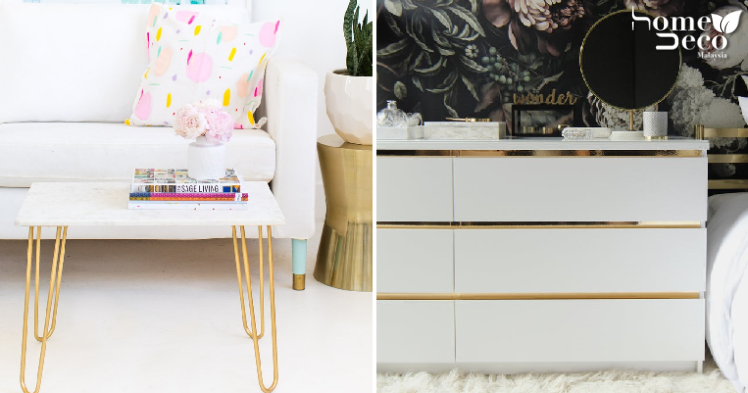 This hack makes the basic side table from Ikea look truly extraordinary and outstanding so you will be surprised that it is actually pretty easy to make with just a few mirrored plexiglass panels. This plain and unassuming shelf is made to look chic and stylish with just the simple addition of some wood panels on top. Not only does it look pretty but the wood actually makes it much more sturdy and durable. Gilding anything with a little gold will instantly make it look extra glam and this basic MALM chest is no exception. With just the application of some simple gold contact paper the drawers look magazine ready and will make your home look fashionable.